This page is a guide to Benalmadena’s best bars, nightclubs, pubs and shows. Benalmadena nightlife – what to do and where to go at night in the Costa del Sol party destination. The Costa del Sol is blessed to have two party towns side by side for party animals to enjoy in Torremolinos and Benalmadena. If a quiet family holiday is what you are after, then Benalmadena is perhaps not the destination for you. Going for a long weekend to Benalmadena has become an ‘in thing to do’ and plenty of fun. Malaga the closest airport is only 12km away and is roughly a two hour flight away from the U.K. and then the party can begin. Where are the best bars, pubs and nightclubs in Benalmadena? What is there to do at night in Benalmadena? Where is the best place to meet women/men/girls/boys in Benalmadena? How much do drinks cost in pubs, clubs and bars in Benalmadena? Our related pages on car hire in Benalmadena and webcams may also be of interest to you. The best area for bars and clubs such as Jesters and Molly Malones is the infamous 24 Hour Square (Plaza Solymar). See our map page to find the location. This area attracts mostly youngsters and as you would expect with many British going here, there are often fights and people getting very drunk. If you are coming on a hen party or stag weekend you will definitely be clubbing in the square. Good bars are the Beer Keller, Dutch Inn, Liquid Bar, Times Square, Alien Bar and Mango’s bar. You can’t fail to get some good drinks bargains here as there are loads of PR’s (public relations) reps trying to get you in their bar with offers of 2 for 1 pints, free shots etc. Try also the Linekers Bar where they do the ‘legendary’ feed the pigeons dance. Below is a video of the twenty-four hour square – where obviously you can drink 24 hours a day for 365 days a year! If you are entering Benalmadena from Torremolinos via the N340 coastal road, it is on the right-hand side of the road just past McDonalds. Below is our map of the 24 Hour Square in Benalmadena. 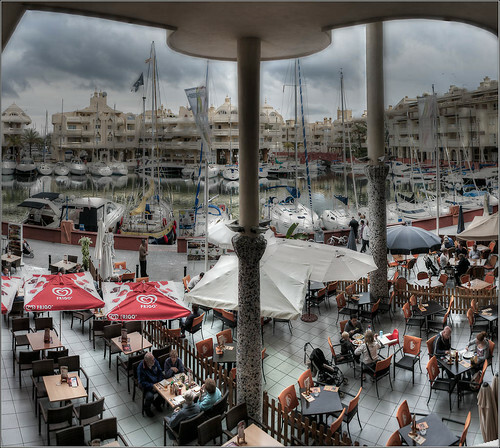 The Puerto Deportivo marina (Calle Levante) is the next best area to go with a wide variety of bars and nightclubs. Be advised however that the marina is much more upmarket and this is the area most of the Spanish would go clubbing as there are lots of Latin and Salsa clubs here. The best places would be Maracas or Kaleido. Young British men and women looking to get drunk on beer and cocktails are best off at the square instead. With the price of spirits averaging €10 each, this is the place to be seen amongst the luxury yachts and power boats. Plaza de Nueva Bonanza is another good cluster of bars and clubs in the residential Avenida Gamonal area midway between Benalmadena Costa and Arroyo de la Miel. Busy and noisy if that is what you want on a night out. Very popular with Brits, popular bars include: The Blue Moon, Las Plumas, Hazy Days, Pekin, The Swan, Bitto, Pipers, Hong Kong, Capricciom, El Cordera, El Karmen, Brians Bar, Legends, Robin Hood, Raquel, Shannon, Johnnies, Eagle Bar, The Old Duck, Keogh’s Pub, Bar Nevada, Ann’s Bookshop, Dec’s, Frying Scotsman and Kasabians. Kiu is the largest most popular nightclub in Benalmadena. Located on the aptly named Square 24, Kiu disco is massive inside and known for its Ladies Night which Kiu hosts every Thursday evening. Kiu night club has three dance floors each offering different beats of music. The Atlantis room at the far end of the club offers even more music, great decor and balconies. Kiu opens its doors to the public at eleven until late. During the summer months it is important to know that entrance tickets to clubs becomes more expensive although once inside the ticket price usually includes one free drink, two if you are lucky, and maybe a free promotional tee shirt. Prices at the bar can be as much as three times the normal price during the popular months of July and August. El Elefante is also a popular nightclub located in the Plaza next to Bonanza Square right in the centre of Benalmadena and offers some live entertainment and acts. El Elefante is undoubtedly one of the best Cabaret and music clubs on the Costa del Sol itself. El Elefante is open seven days a week and charges the normal amount for drinks instead of jacking up the prices in the summer months. Disco music starts at midnight and the club opens its doors to teenagers accompanied by adults as well. On the marina of Benalmadena you will find the Ice Bar where everything is made of ice. The bar, walls, chairs and even the glasses that you drink your cocktails out are all made of ice. Guests are provided with hats, socks and gloves at the entrance so you can enjoy your chilled out evening in comfort. The ice chairs are covered to stop the guests from sticking to them. The Ice Bar is one of the most unusual late night bars to have a night cap in, reminiscent of the Ice Hotel in Finland. The Banana Cafe is located on the marina and is frequented mainly by the young who dance to all kinds of music. There is one big dance floor to boogey the night away. The menu of cocktails is extensive and reasonably priced. Vast numbers of visitors come to the club from the surrounding tourist resorts to make for a jam packed dance night until the early morning hours. La Cubana is situated in the marina, playing mainly Cuban and salsa music the typical visitor spending an evening here is in their thirties. The club opens its doors at eleven thirty in the evening until five thirty in the morning. La Cubana has an outside terrace with a bar as well as the dance floor inside which too has its own bar. 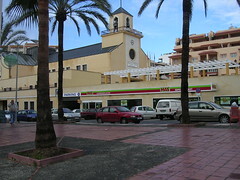 Discoteqa Aqa is one of the top discos in the Benalmadena marina. The club has a large outside terrace for revellers to enjoy as well as an indoor dance floor. This is a more upmarket discotheque where a strict dress code is enforced in other words shorts and tee shirts are not allowed. Aqa is one of the more popular night clubs in Benalmadena and is very busy during the summer months attracting a more eighteen to thirties age crowd. Disco Terraza Monet is a place to have your afternoon coffee and transforms itself in the evening as a hot spot in the port at night. Mainly frequented by foreigners in the summer months, many young local Malaga City visitors flock to Disco Terraza Monet because of the great music. Disco Cafe Kaleido offers the dedicated clubber three very different sections in the club each with their own music and atmosphere. There are terraces outside the club, inside the club as well as large dance floor to boogey away. The focal point of Disco Cafe Kaleido is a large fish tank filled with beautiful exotic fish. Buzby’s Bar is a British run bar featuring cabaret and live acts as well as music. Buzby’s Bar is situated on the coast road across from the Hotel Villasol. Peacock Tavern is a firm favourite with families who wish to have an enjoyable evening with live music set in garden-like surroundings. Happy Hour takes place every evening between eight and nine o’clock in the evening. Wyn’s Bar is located in the Pueblo and features mainly live entertainment in the form of live acts, impersonators and comedians, the Monty’s vocalist is one of the better known acts. Bar Marfil allows you to enjoy coffee in the afternoon and transforms itself into a vibrant throbbing night club at night where you can jive to the salsa beat. The Boulevard in the Puerto Marina Benalmadena is a great place to enjoy a cocktail on the terrace and then go inside to dance. El Desvan located in the Puerto Marino is open from seven every evening until three in the morning. Here you can enjoy live music or dance away to sixties music. Mondino is a busy disco pub which opens at eleven in the evening and is located in the Puerto Marino. Here you can dance away to the music of the moment. The Swan is an English pub to enjoy your sun downers. One of the most popular bars in the port it is very busy at the weekends. Swan opens its doors at seven in the evening and closes its doors at three in the morning. Tabu is a cocktail bar open from eleven in the morning until six in the evening. Here you can have your breakfast, lunches and snacks. Many people come here in the early evening to enjoy a cocktail. Thursdays and Sundays are Women’s Day. Valparaiso is a disco club open from nine in the evening until five in the morning where you can dance to current disco music. Valparaiso is located in the Puerto Marina of Benalmadena. Mana is located in the port and is open from eleven in the evening until five in the morning. Mana is a discotheque to spend the evening at. La Ola is an outside club located in the port. Open eleven until late La Ola is known to have a very good wide range of music. Joy is in the Puerto Deportivo and is open from eleven in the evening until six in the morning. Joy is a typical Spanish club with live music. As you can see from the extensive listings above, Benalmadena has a wide range of discotheques and nightclubs, for clubbers and bar hoppers to enjoy. For even more nightlife try an excursion to Torremolinos which is right next to Benalmadena although Benalmadena is rated as better.